Please let me know if you try this out (take pictures please!!!) and I would love to hear your thoughts. In a saucepan over medium-high heat, combine wine, vinegar, shallots, thyme and bay leaf. Boil until liquid has evaporated. Stir in the heavy cream, and boil until liquid is reduced by half. Decrease the heat to the lowest setting. Whisk in the butter, 1 cube at a time, melting each one before adding another. Do not allow sauce to simmer (or it may separate). Once all of the butter has been melted in, strain the sauce into a glass bowl. Add in salt, pepper, chives and lemon juice. Keep this sauce warm by placing the bowl inside another glass bowl with hot water in it. This way the heat from the water will indirectly eep the beurre blanc warm. Rinse the fish fillets, pat them dry, and season them with Kosher salt and pepper. Heat oil and 1.5 tablespoon butter in a large skillet over medium-high heat. Do not let the butter burn! Cook the halibut fillets approximately 3 minutes on each side, or until lightly browned, and just cooked through (you don’t want to cook them all the way through). Transfer the filets to a baking sheet, and let them cool for approximately 5 minutes. Meanwhile, in a small bowl, stir together the panko bread crumbs, almonds and 2 tablespoons of the melted butter. 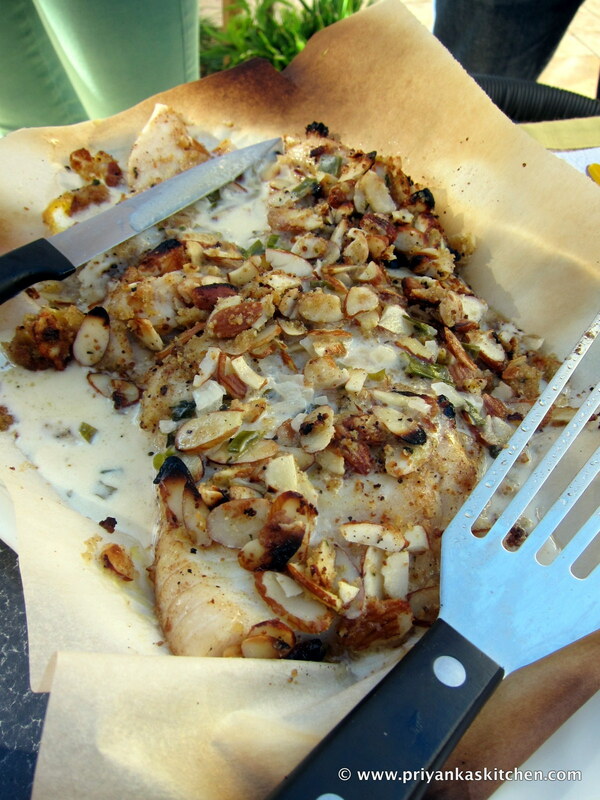 Brush the tops of fillets with egg, and spread with the almond mixture. Broil the fillets 1 to 2 minutes, or until browned (watch closely because the difference between a perfectly cooked halibut and a burned halibut can be just a few, mere moments). Place fillets on individual plates, and spoon beurre blanc (and lots of it!) on top of the fish and around it. Serve immediately (and enjoy immensely!). This entry was posted in Fancy Dishes to Impress With!, Italian, Kid-Friendly, Seafood by priyankaskitchen. Bookmark the permalink.